Best blog name generators to come up with perfect blog names, every time! 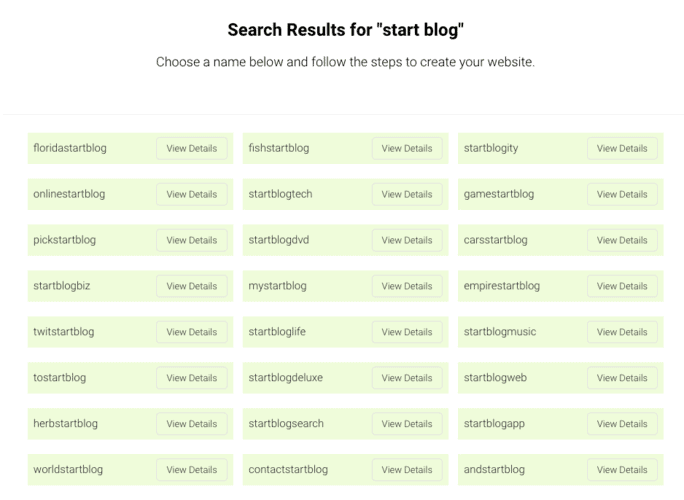 Looking for a blog name generator for your upcoming blogging project? While there are dozen a dime blog and domain name generators, here are the best few I use to generate good blog names that stay in your readers’ minds. Before you think about naming your domain for your blog, you need to know about the different types of names you can have. The type of name you choose can have a strong impact on how your blog performs. The search phrases or queries that people type on Google to search about something are known as keywords. And with keyword based domain names, you try to have your main keyword (the phrase you want to rank for in Google whenever anyone searches for it) as your blog or domain name. For example, if your primary keyword is paleo diet (which means you want to get visitors/readers whenever anyone searches for “paleo diet” or related terms) then you can choose the blog name, PaleoDiet.com. Now, you know this blog name will not be free to register. Partial match domains (PMDs): Domains or blog names that have your primary keyword plus a prefix or suffix. Here are some partial match domain examples: besthoveroardtribe.com or domainsherpa.com etc. Please note: After a lot of EMD abuse, Google came up with the EMD update that devalues domains with exact match keywords. So, you better want to stay off that domain strategy. Brandable domain names are unique or custom-created blog names that are never used elsewhere. They depict your brand online. If you’re looking to create your own brand, using your own “personal name” is one of the best personal blog name ideas. This is a good idea if you’re a writer or offer service based business like consultation etc. Don’t be afraid if your chosen name isn’t heard of before. Google wasn’t known when it started neither was Microsoft a household name. Coin your own blog names with parts of your business name or your personal name. Now that you’ve an idea about the different types of blog names let’s head over to our blog name generator section that will assist you in finding the best blog names. Now that you know what type of domain is right for your business let’s quickly start exploring all the tools one by one. Lean Domain Search is my favorite go to blog name generator tool and it never disappoints me. It’s so good that it got acquired by Automattic, the company behind WordPress. With its advanced search engine you can generate thousands of domain names ideas in a matter of seconds. On a side note, here are 23+ benefits of blogging that will blow your mind. Furthermore, they have got some handy filters like sorting the results with its popularity or length to give you the domain name of your choice. One of the best features I love about this tool is, they give the highest priority to .com domain names while scraping it from Namecheap, Godaddy, and Bluehost. On top of that, it also helps you find whether the name is available on Twitter or not. Like for this example, I tried searching for a blog name related to my niche, “blogging”. I got suggested a plethora of clever blog names almost instantly and I liked this particular one called, “FindBlogging.com”. 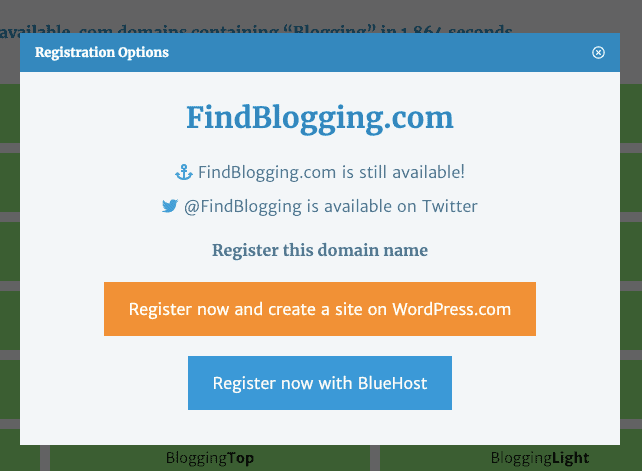 Besides being available to register right away, Lean Domain Search goes a step further and shows if the handle “FindBlogging” is available to register on Twitter. This is very essential because having a consistent brand presence across all social media platforms is very important. PRO TIP: Not only Twitter, make sure your blog name has a available username on major social media channels. You can do that easily using a social media name checker tool like KnowEm. Panabee is by far the simplest blog name generator in our list that makes finding clever blog names a breeze. Hop on to Panabee’s website and type in two words around the niche or online business you’re about to start, and Panabee will churn out the best blog names for you. Panabee uses additional prefix and suffix to give you more domain name with the variation of keywords you added. Additionally, they support multiple high-level TLDs like .com, .net, .org, .in, .us and many more. Also, if you like to register a certain TLD domain use it with the keywords and Panabee will do behind the scenes search for you to find the best possible name. You see all the domain names that are available and also the price at which they are being offered. As you click on the domain name, you’ll be redirected to Godaddy where you can buy it instantly. I prefer NameCheap as my preferred domain name registrar because it is cheap and offers privacy protection for free. Namemesh is an easy to use free blog name generator that I personally use to find brandable and short domain names. All you need to do is type in a keyword and let Namemesh do the hard work of finding creative names for blogs. Moreover, you can also add the domain name in the favorites list making it simple to compare with other domains before finally making the purchase. You can also add filters like domain registrar company, TLDs and the maximum length to find the right domain for your brand. Namemesh is not only a great brand name generator, but you can also register the domain name directly with the help of Godaddy and Namecheap registrars. Two words when combined make a wordoid. Whether you’re looking for lifestyle blog names or travel blog names, Wordoid has got you covered. It offers plenty of blog name suggestions even if your desired blog name is already taken. 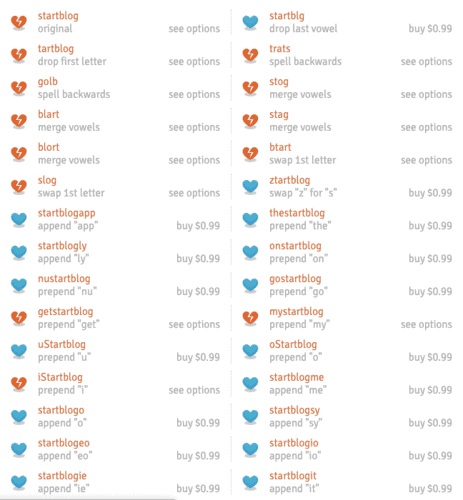 By helping you merge two or more words to create unique and brandable blog names. You can set filters like the language of a domain, character length, a pattern where you want the keyword to show (beginning, ending or containing) and the quality level of the domain (high, medium or low). 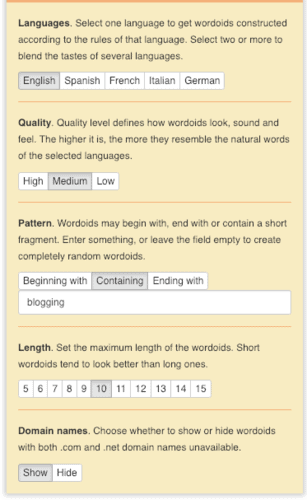 Wordoid generates great blog names from your search that are easy to pronounce but isn’t available in the dictionary. You can browse and generate unlimited free domain names on Wordoid without creating an account. However, if you’d like to see the recent searches you need to create an account to keep track of it. You can use Google or Facebook account to create a Wordoid account. Nameboy is a color-coded domain name generator similar to Namemesh that gives you short and concise brandable domain names from your keyword search. If the domain is available to buy you get a green color code. If you have an eye on any premium domain name, you can also place a bid with the help of Nameboy. If you have an account on Nameboy, you can keep track of all your previously searched domain or blog names plus you can also keep them in cart to instantly buy it in the future. Nameboy checks the domain availability with Bluehost so anything and everything available with Bluehost will be shown to you by Nameboy. As you can see I got plenty of good branded short domain names which I could never generate while brainstorming. Launched in 1996 DomainIt is helping bloggers like YOU and me with blog name suggestions that are ready-to-be registered. No matter whether you’re looking for a fashion or beauty blog name generator or a food blog name generator, DomainIt is what you need. They have an intuitive user interface that is easy to understand. 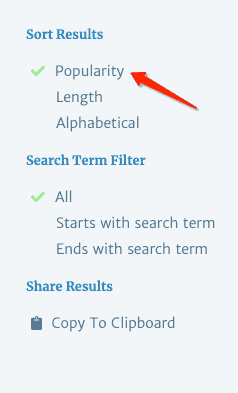 Just search for the primary keyword in the search bar and let DomainIt do the grunt work for you. In a new window on the left, you’ll have all the popular domains from which some are registered, and many are available to register. On the right, you have all the premium domains which you can bid, and right after it, there’s an “Other Domains” section where you can explore numerous other TLDs. DomainIt has another handy feature known as “Bulk Search” wherein you can upload all the domains name that you have in your excel sheet and hit search. With this, you can instantly see what all domain names are available for you to register. This tool can come in handy if you are looking to register expired domain names. 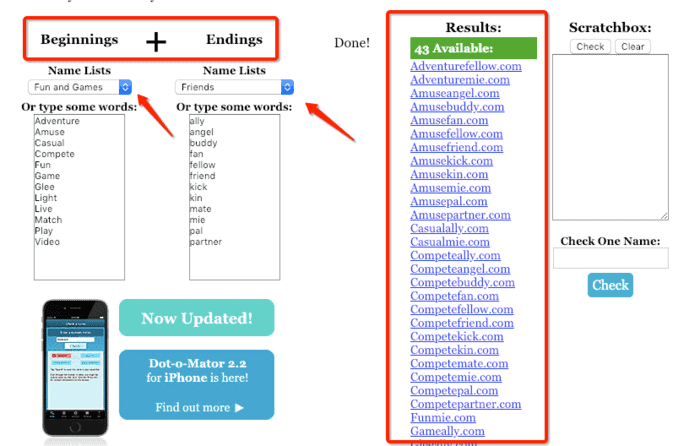 Dot-o-mator is another best blog name generator tool which is also available to download on your iPhone. So, now you can even search for great domain names on mobile, while you are away from your computer. It combines the beginning + endings of the keywords you enter and check whether if the other variations of the entered keywords are available to register or not. You can also use from the pre-filled drop down options they have. For instance, I’ll choose “Fun & Games” in beginnings and “Friends” in endings. Finally, click on the combine button and see the magic. The fun part about this tool is you can add unlimited keywords in both the beginnings and at endings which will generate thousands of cool domain names for you. To add more spice to recipe Dot-o-mator also has a web2.0 name generator. Our next tool of choice is NameStation. You have a plethora of options to choose from while deciding a good name for your blog. Options like random name generator, short name, combine two keywords, compound words will fill up your mind with lots of interesting ideas. You can also hold crowdsourced naming contests to find blog name ideas from their community. Furthermore, it will also give you related keyword suggestions that resonate with your primary keyword. You can use Namestation blog generator tool for free. However, certain features like custom name and search history will only be available once you sign up for an account. PickyDomains takes a different route altogether. If you’re finding it difficult to come up with blog names that you desire, you should look for services where humans offer you blog name suggestions rather than search engines. PickyDomains is one such service. Yes, they do charge you a fee of $50 but only if you are fully satisfied with the domain name suggested by the team. The way it works is, you sign up for an account and tell the requirements and the type of domain name you’re looking for. PickyDomains expert team will note down your suggestions and use their domain hunting brains to get you the best domain available in the niche. It’s a 100% risk-free service where you get your money back if you’re not satisfied with the domain name they suggest you. PickyDomains also provides other services like logo making, SEO and slogan orders (good for blog title generation ideas). Domain Hole is a freemium type expired blog name generator. Don’t worry, the free version is more than sufficient for us. 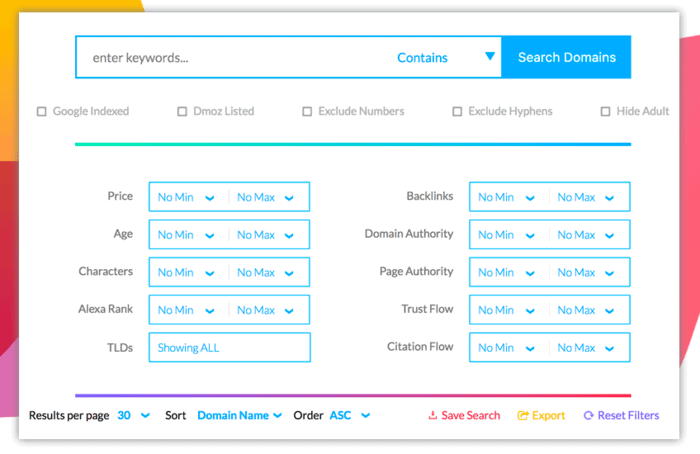 With Domain Hole you can search for over 100+ TLDs plus they have some very powerful filter options to never let your ideas drain. If you plan to go with their paid plans, you open up a whole new level of domain search functionalities. Features like expired domains, advanced filters, save searches and export are only available on their paid plans. One more exciting feature about Domain Hole is you can watch or keep track of domains that are about to expire, and they will send you an alert message with a register link so that you can get your hands on domain asap. Coming up with a great blog name is an art, and these cool blog name generators make the job easy. If you ask me which is the best out of all the ten, I’d prefer Lean Domain Search as my free option. Click here to comment which domain name generator tool you would use to find a name for your blog. Also, if you liked what you read do consider sharing the article with your other blogging friends. Bought your domain? Here are 10 things to do with your it. 1. What are some best places to register your blog domain name? NameCheap.com: Namecheap is our preferred domain name registrar. They’re not only affordable and offer free privacy protection but also are trustworthy and have a lot of options to get the most from your domains. We’ve 23+ domains registered with NameCheap so far and some are over 5 years. BlueHost.com: If you want a free domain name along with your blog hosting, nothing beats Bluehost They’re officially recommended by WordPress.org and are great value for money hosting services for starters. 2. How to determine how good is your blog name? There is no metric to determine how good your blog name is. Just make sure it is short and memorable, easy to pronounce and doesn’t contain numbers or hyphens. Do make sure you don’t violate copyrights. 3. What are some anonymous blog name generators? Almost all domain or blog name generators listed here are anonymous. Just make sure you don’t sign up to them or create an account if privacy is your concern. 4. What should I name my personal blog?? The best tip is to use your own name to name your personal blog. Using your own name will bring that personal touch to your website. Another idea is to use the theme of your blog content to name your personal blog. For example, if you’re writing about money saving tips you can name it ThePennyFairy.com etc. Thank you for the above information as domain name should be choosen wisely because a good Domain helps in improving site ranking and traffic. 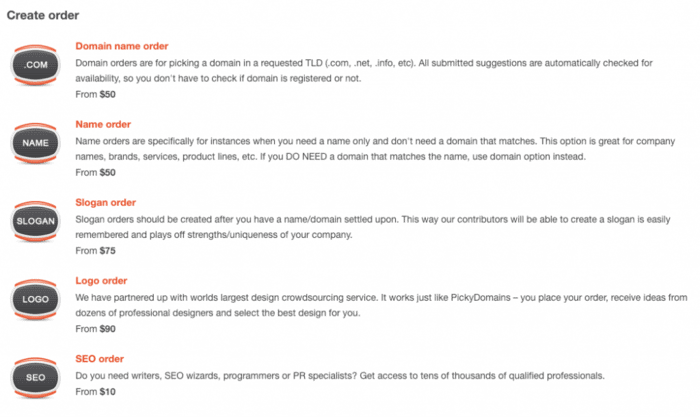 When I started, I chose domains with exact match keywords. They do work (sometimes) in 2019 but I would now prefer shorter and brandable blog names rather than keyword rich ones.